The world has seen significant change in the last few decades, and students will require new skills. 21st century learning and the tools that make it possible allow students to get the most out of their time in school and help students get prepared for the world they'll encounter once they leave school. What this means is that schools must provide the knowledge, skills and expertise students need to succeed in work and life in the 21st century – and the tools to build those competencies. 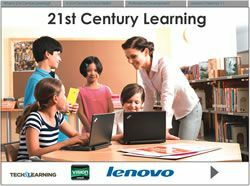 This eBook will explore why 21st century learning matters and which technologies are best suited to move students and schools into the 21st century.